The Kalka Shimla railway line is not only boasts of a scenic journey but has a resplendent history related with its construction as well.The 96 Kms. Journey takes one from a height of 656 meters (2,152 feet) above mean sea level at Kalka to a height of 2,076 meters (6,811 feet) at Shimla.This railway has an gradient of 1in 25 or 4% which is rather steep and therefore, the railway line has been designed as such that the trains wheels do not skid even during heavy rains. Due to this technical expertise this line is included in the Guinness Books of World facts & feats as the narrow gauge engineering achievement of India. 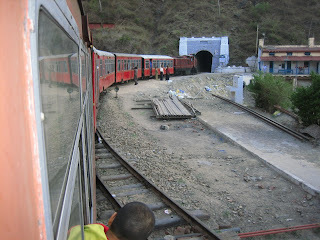 this tunnel is 1,143.61meters (3,752ft) long and remained for a long time the second longest tunnel on the Indian Railways. The contract for construction was awarded to the Delhi-Umbala Company in 1898 at an estimated cost of Rs86,78,500, however, the cost doubled during execution of the project and it was finally purchased by the state in 1906 for Rs1,71,07,748. The 96.54km line was opened for traffic on 9th November, 1903. Because of the high capital and maintenance cost, coupled with peculiar working conditions, the Kalka-Shimla Railway was allowed to charge fares that were higher than the prevailing tariffs on other lines. However, even this was not good enough to sustain the company and the Government acquired the company on its request in January, 1906.There is a recorded history of a holy person named of Bhalkoo, the illiterate genius whose extraordinary engineering acumen played a vital role in the construction of the Kalka-Shimla rail line and has since been recognized. capabilities could be judged from the numerous certificates issued to him by them. He was not only associated with the construction of the Kalka -Shimla rail track but was also instrumental in laying out the alignment of the Hindustan-Tibet road while serving in the hills road division. The mysterious character vanished mysteriously. No one really knows where he disappeared after embarking on a pilgrimage to Jagannath Puri more than 100 years ago.